Begins working within 12 hours to kill fleas on contact. Kills eggs, larvae and adult fleas to break the life cycle and help prevent re-infestation. Waterproof formula continues working for up to four weeks, even after bathing. Convenient, monthly topical application contains imidacloprid and pyriproxyfen. Advantage? 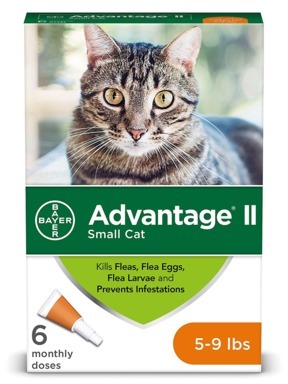 II is a topical flea control for cats that kills fleas through contact, so fleas do not have to bite to die. Advantage? II kills fleas rapidly within 12 hours of initial application. Reinfesting fleas are killed within 2 hours with protection against further flea infestation lasting for up to a month. Pyriproxyfen provides the additional benefit of killing flea eggs and larvae to effectively break the flea life cycle. For use on cats and kittens 8 weeks of age and older, weighing 2 lbs. or more. Advantage? II is a monthly topical flea control for dogs that kills fleas through contact, so fleas do not have to bite to die. Advantage? II kills fleas rapidly within 12 hours of initial application. Reinfesting fleas are killed within 2 hours with protection against further flea infestation lasting for up to a month. Pyriproxyfen provides the additional benefit of killing flea eggs and larvae to effectively break the flea life cycle. For use on dogs and puppies 7 weeks of age and older, weighing 3 lbs. or more.